SMITA Research Lab, IIT Delhi was selected by the Technology Development Board, Department of Science & Technology, Delhi for the National Award-2016 for successful commercialization of indigenous technology. The award is being for commercialization of N9 Pure Silver: developed jointly in collaboration with SMITA Research Lab, IIT Delhi, ARCI, Hyderabad & M/s RESIL Chemicals Private Limited, Bangalore. 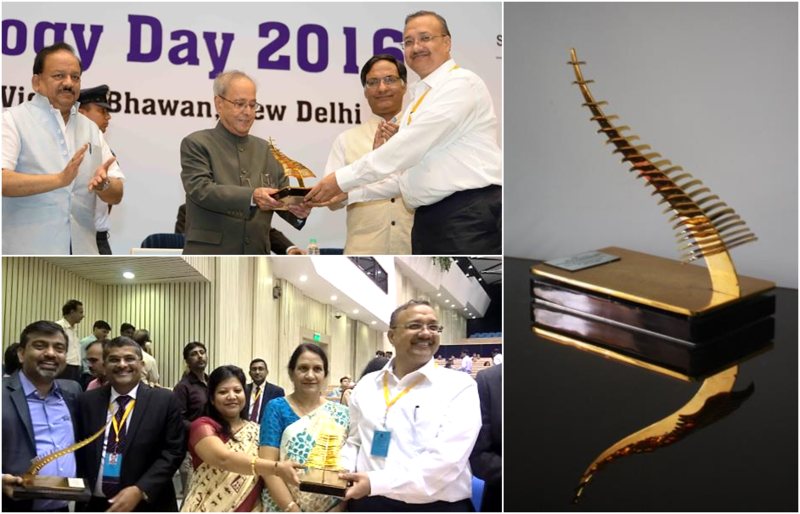 Both the technology partners, SMITA Research Lab, IIT Delhi and ARCI, Hyderabad alongwith M/s RESIL Chemicals Private Limited, Bangalore received a trophy and award on the National Technology Day being celebrated on 11th May 2016. The award was presented by Shri Pranab Mukherjee, the Hon'ble President of India, in the presence of Dr. Harsh Vardhan, Hon'ble Minister of Science & Technology and Earth Sciences, Prof. Ashutosh Sharma, Secretary, Department of Science & Technology and Dr. K. VijayRaghavan, Secretary, Department of Biotechnology, Government of India.